Newest Tampa Bay Ray (Manny Ram) Says Yes I Can! 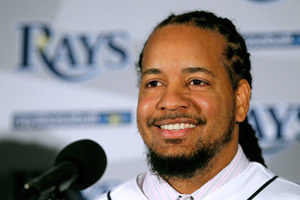 Doubters beware…Manny Ramirez has a chip on his shoulder and a lot to offer the right team during 2011…and that team is the Tampa Bay Rays. “I don’t know, it’s just me,” he said. “I want to go and get that feel back that I still got it.” Got it as in leadership spirit, power slugging numbers, and timely hitting…like when he hit .332 with 37 home runs and 121 RBIs while splitting time between the Red Sox and the Dodgers in 2008? “I wish,” he said, “but I’m going to go and give all I got. ... I just got a chip on my shoulder that I want to be here, I want to get my stuff right and show people I can play,” said Man-Ram when he showed up to Tampa Bay's spring camp five days early. As far as leadership spirit goes, Manny is definitely saying all the right things: that he doesn't care where he hits in the lineup, and he's excited to join this young club. This despite the fact that he was signed just days before the beginning of Spring Training and promised just $2 million by the Rays…one-tenth the amount he was paid last year to split his season between the Dodgers and the White Sox. 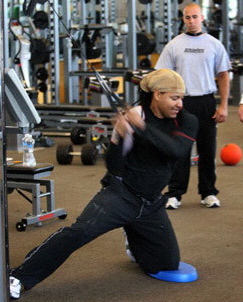 Prior to the 2007 season, Manny never practiced his hitting or throwing in the off-season. For most of his career, “Man-Ram” had always used his off-season for strength training and body-toning with trainer Juan Carlos Santana in Boca Raton, Fla. But he never had a regular routine for fine-tuning his baseball skills. In 2007 he decided to move his winter workout to a facility called Perfect Competition, which is much closer to his home. The idea was to join other professional athletes working out at the facility and continue buffing up as he always had in the past. But once Ramirez arrived for the first time, he found his off-season routine taking a whole new turn. The more Ramirez took part in his new regimen, the more he embraced it – with five day a week workouts stretching to 2 1/2 hours. He was the earliest guy there every single day, he didn't take breaks and just got after it. 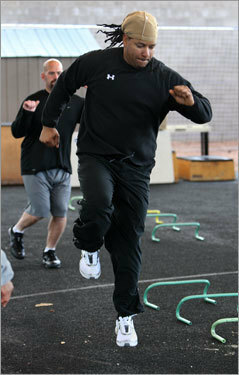 Today Manny works hard in the off-season to get his body ready for spring training. He takes about ten days off after the season ends, and then begins a strenuous workout regimen with one of the toughest trainers in the business. Manny’s off-season advice for young players: "You want to get good? Work hard."